I first arrived at the Sharklab in October 2009, where I spent two months as a volunteer and got my first encounters with wild sharks. Through this unique experience, I decided to cancel my enrolment in a Cell Biology Master’s Program at the University in Bern, Switzerland, and signed in on a graduate program in Animal Biology. This allowed me to return to the Sharklab in January 2011, where I worked on my Master’s project until August 2011. 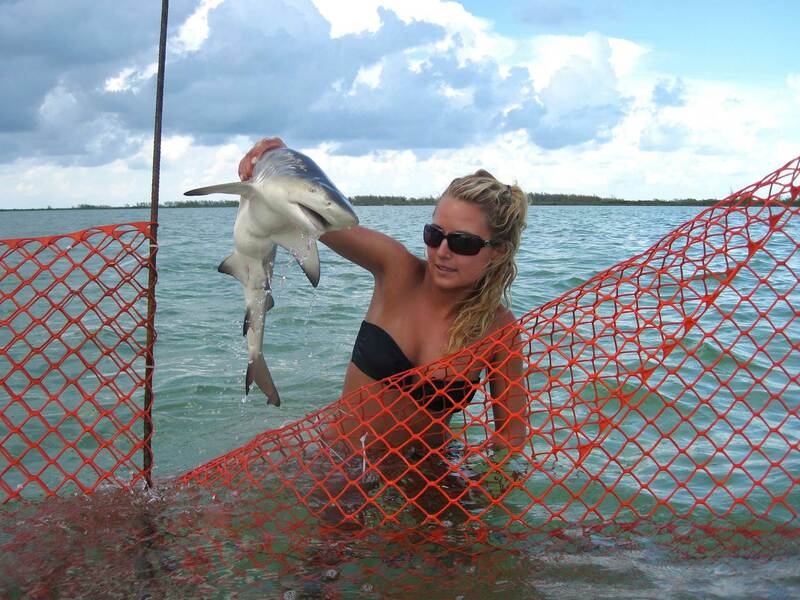 I examined the diet of juvenile lemon sharks and the effects of anthropogenic habitat destruction on their diet. After leaving the Sharklab, I was then accepted to work for the BBFS Jupiter Lemon Shark Aggregation Project in Florida from January to February 2012. 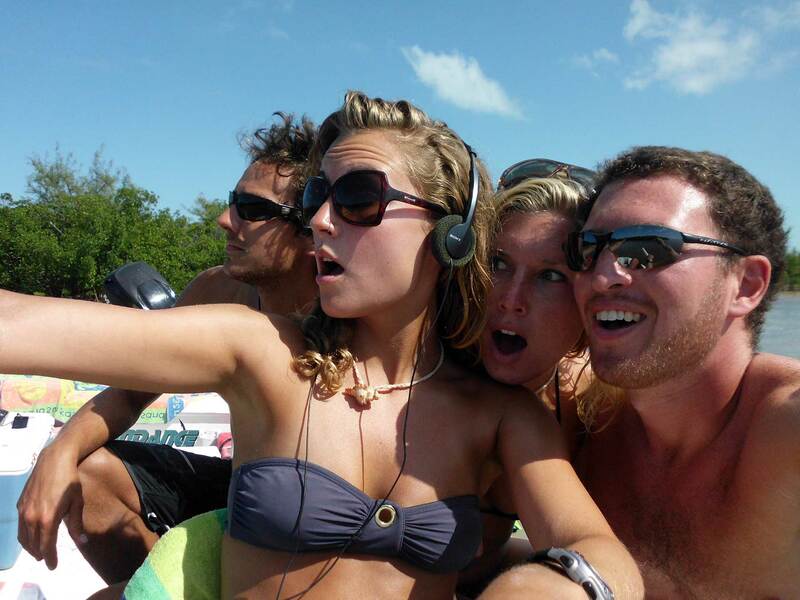 This internship helped me to apply my acquired Bimini fieldwork and shark handling skills, and at the same time I enjoyed working in a highly independent and motivated small team. Lost in translation: I remember that specific day that we went for a shark dive and I was put on the Twin V driven by Doc to help him setting up the well-known shark Caribbean Reef shark dive. After arriving at the spot, in order to decide where we want to put the boats, Doc gave me a canister and was told to let him know in which direction the current is going. First of all, I did not understand what he told me, because my English skills were not that elaborated yet, and second I just didn’t understand why I was given a little canister of wired purple powder!? Somehow, and with some quick advice from a staff member, I managed to drop some grains of the powder into the water and told Doc, while feeling insecure and intimidated, where I thought the current was going. PIT food runs: One night during PIT 2011, Emily Marcus, Brian Franks, and I were on home crew and were responsible to bring the food to the netting boats. Earlier on that day, we found some very old glow sticks on the bottom of the bait freezer below huge a pile of smelly bait. So we decided to get our wetsuits on and stick those smelly glow sticks on our body and deliver the highly awaited food to the net boats out there in the North Sound. With trance music and some good dance moves, Emily, Brian, and I arrived there and managed to serve the food, while still dancing to the rhythm of the trance music. Squid: One day, coming back from a long day in the field, I got hit by a squid right into my face. We were sitting in the skiff and this little squid smashed into my face, fall down on the floor, and inked the whole bottom of the skiff. Everybody was pretty surprised that this happened, and I definitively will never forget that evening. Batfish: One day in March 2011, I was tracking juvenile lemons in South Bimini together with CJ Crooks, Jean-Sebastien Finger, and Michelle Frost, we thought that we detected a new species!! It was Jean who jumped in the water to catch this unique, newly discovered species that we then took back to the lab to present to the staff members. To our disappointment, it turned out that this “unique” fish with its wired leg sharped fins and the prolonged nose, was a so-called and quite common bat fish. Meeting Doc was on one hand a very exciting moment, after knowing so much about him and his research, but on the other hand, also quite a freighting moment, since I knew what an amazingly important and famous researcher he was. But then the first meeting went very well, also due to the support and assistance I got from the former PI’s of the Sharklab Dr Steve Kessel and Dr Brian Franks. After having met Doc, I was also privileged to get to know Marie, which also had a great impact on my life and my scientific career. I adore chatting with her, her warmth and general interest in Sharklab people, and the trust and motivation she constantly giving me. Marie and Doc both left a lasting impression on me and I’m impressed about how passionate they are living their lives and how many people they have positively influenced over these years.